Thank You, to the "Texoma Classic" sale for allowing us to donate Black Kettle's Girl to raise money for the Green Beret Foundation. Thank you Reese Longhorns for your belief in our program and the purchase of Cowboys Paint. This calf has conformation, genetics and color to die for. She is simply a top shelf animal that will do well on the show circuit and be a Cornerstone cow for any herd. Thank You, Michael Cannaday, for your purchase of Lucie. 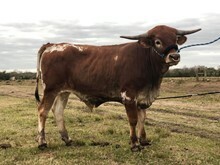 She is a really solid cow with great looking horn. It was a tuff decision to let her go but you just can't keep them all. Can't wait for you to put up on line what she and Smoke produce for you. 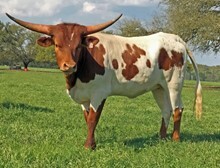 Thank you Reese Longhorns for your purchase of.Concealed Beauty. This was a really tuff decision to let her go. Beauty has genetics galore and stunning colors that are darkening up. Concealed Weapon and Loomis breeding on top with the always great producer JP Rio Grande and Legend Valley breeding on top and bottom. She has nothing but up side in her future.